I never saw Kaleidoscope coming. It's Beer Friday at Devil's Canyon, the neighborhood bash they hold the last Friday of each month, where they open up the brewery, roll in a food truck, and bring in a band or two, and serve beer. If you're lucky, they'll pour a special, limited release. With SF Beer Week just ending, they had four, count 'em, four special beers brewed for SF Beer Week left over. Having missed most of SF Beer Week due to work and family committments, I was glad to sample some of these beers before they were gone for good. By far the most impressive of the bunch was Kaleidoscope, and beer that defies conventional description. Kaleidoscope was the result of a nine brewery collaboration between (take a deep breath) Devil's Canyon, Pacific Brewing Laboratories, Triple Voodoo, HighWater Brewing, Golden Mongoose, Phat Matt's, Two Monkeys, MyBucca, and Red Cup Lager. What's surprising about this collaboration was how all those guys could actually all fit inside a brewery and create something drinkable, smooth, with a restrained complexity. But I'm glad I didn't. The spicy pork quesadilla I had with this beer made it a little difficult to fully gather in all Kaleidoscope's flavors, but there were plenty of roasty flavors from the dark malts, a light spiciness that seemed like anise and some subtle aromatic quality I couldn't put my finger on, and a noticeable but well balanced grassy and earthy hop finish. It was one of the most unique, indescribable and most importantly, tasty brews I've ever had. And only 5% abv, it was arguably sessionable. "Starting with the general framework of an IPA, the group gravitated toward these malt elements: Pale malt, crystal malts, biscuit malt, oatmeal, roasted wheat, rice and a few other surprises were selected. To make things really interesting, Green and Black Teas were added to the mash. For the hop additions, an “inventory clean up” approach was undertaken; a little of this, a little of that. The bitterness levels were kept on the lower side to allow the tea and whirlpool additions to come through. And speaking of whirlpool additions… dried currant and Grain of Paradise were added to play off the unique flavors contributed from the mash. Throw in some English Yeast and the beer was underway." OK, well that explains what they used to brew it. How they worked together maintaining the skill, restraint and most likely humility required to prevent this beer from turning into a horrible monstrosity is a secret they'll probably keep to themselves. A bunch of brewers, throwing a whole lot of ingredients together and producing something smooth, drinkable, complex but restrained and balanced isn't just impressive. It's miraculous. ﻿Menlo Park's Willows Market looks like a typical upscale grocery store in some old money neighborhood. But you don't have to look hard to discover its true aspirations. Signs outside proclaiming "Ale!" or "Almost 1,000 craft beers in stock" reveal that deep down, this boutique grocery store secretly wants to be a bottle shop. Walk right in and the first place you'll find yourself is the Belgian Beer Cove at the front of the store. How often do you find something like that at some little independent grocery store? Make your way to the back and you'll find beers from all over California, the United States, and the World that are hard, if not impossible, to find elsewhere in the Bay Area. There are helpful signs letting you know certain selections scored high on Ratebeer.com﻿. Maybe 20% of the floor space is devoted to beer, pretty high for a grocery store, and more than a few liquor stores. I hear they have a good deli and butcher section, but I'm just there for the beer. 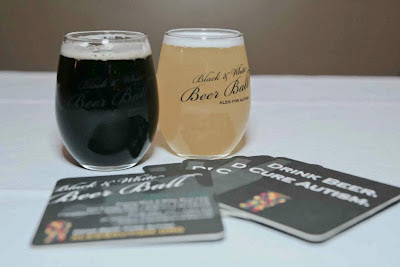 Ales for Autism's First Event a Success Despite a Big "Problem"
So just how did things go with Ales of Autism's first event, their Black and White Beer Ball held last February 17th? Well, they had a small problem when one of the participating breweries submitted a beer that wasn't black or white, and thus didn't fit the event's format. That was quickly overlooked since this denoted beer was none other than the legendary Pliny the Younger! Given this was the biggest "problem" of the evening, it's no surprise that Ale's for Autism first event was a rousing success. "I don't have a final number, but we raised about $3,000! ", recounted an enthusiastic Greg Coll, founder of Ales for Autism. "There were around 300 people and it was a great success. Almost everyone dressed up and they could not stop talking about how they wanted to go to the next (Ales for Autism) event." And just what is the next Ales for Autism event? Why it is a release/tasting party at Pyramid Brewery in Berkeley on April 7th from 1-4pm for $20. Unlimited tastings and 100% of the proceeds go to Ales for Autism. As over 1 in 150 children diagnosed with autism, someone you know is probably struggling with this affliction in their family. 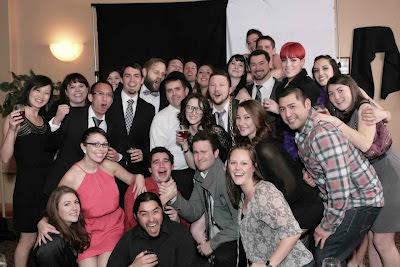 So let's thank Ales for Autism and all those who attended last Friday's Black and White Beer Ball, who all got together to support those struggling with the autism. 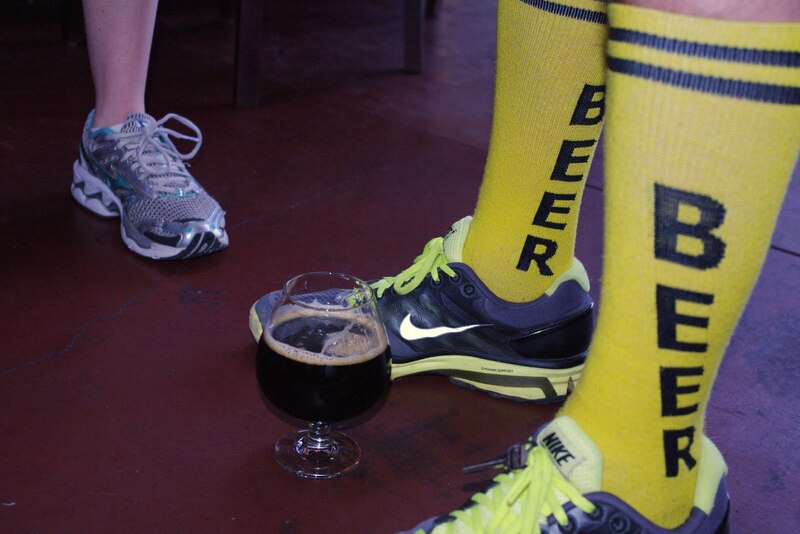 Over a hundred beer runners came together to go for a run and share a beer afterwards. Approximately 55,000 calories were burned. Many fine Social Kitchen brews were savored. New friends were met. Old acquaintances were reestablished. Many lucky beer runners took home some great raffle prizes. Over $200 was raised for Autism Speaks and Contra Costa Food Bank in memory of Bill Brand. Feeling a little sick, I approached my usual Saturday morning long run more carefully than usual. Instead of going out hard and holding on, I carefully hydrated, paced myself, and took it easy to avoid getting hammered. And it worked, as I got through the 12 miles slower than usual, but unscathed, so hopefully the run help build me up, rather than tear me down and leave me with a raging fever. Having barely recovered from the 12 miler, it was time to head out to The Bistro Double IPA Festival, one of the headline events at SF Beer Week. And to survive a festival featuring some of the finest high alcohol palate searing hop monsters known to humankind, I made sure to be carefully hydrated, to pace myself and take it easy to avoid getting hammered. Yours truly savoring the taste of Pliny the Younger after not standing in line for it. I am not a patient man and hate standing in lines. Long lines are often part of beer festivals. Which is why I love the The Bistro Double IPA Festival as whatever lines exist move rather briskly. The first beer I sampled was none other than Russian River's legendary Pliny the Younger, which many people wait in line for over an hour for. But at the Bistro Double IPA Fest, I simply walked right up to the pitcher to get my sampler glass filled. Even I can deal with a line consisting of zero people. What to say about Pliny the Younger? The hop aromas were so strong, they actually penetrated my stuffy nose. And what really makes this work is the hefty amount of light malt, which gives the intense fruity hop flavors a certain juiciness. Of course, there were other beers to explore and enjoy. I find beer festivals are good for checking out new breweries or ones that don't normally distribute in Northern California. And so my three new discoveries that afternoon were Kern River Brewing, with their excellent Citra Double IPA, Bend Oregon's Boneyard Brewing with a couple of excellent offerings, and Six Rivers of McKinleyville, CA with their surprisingly smooth Sasquatch. Six Rivers Brewing Sasquatch: Really smooth tasting, with a pleasant tea-like bitterness. Dogfish Head Burton Baton: Another smooth brew with a light woody taste that melded with the hoppy bitterness. Boneyard Brewing's Hop Venom: Another smooth Double IPA with a restrained hoppy bitterness. Green Flash Palate Wrecker: Lots of strong pineapple-like hop flavors, basically Green Flash's famous West Coast IPA on steroids and working out hard in the weight room for six months straight. It wrecked my palate. Maui Brewing Double Overhead Double IPA: Very hoppy and bitter. Magnolia Gastropub Promised Land Double IPA: Very bitter and hoppy. OK, after having a few beers primarily designed to blow away your taste buds with hoppy bitterness, pretty much all you can taste after that is a lot of hoppy bitterness. A cup of coffee after the festival tasted hoppy. I'm glad to get through the day intact, because there is a beer run tomorrow. UPDATE: You can find the winners of The Bistro Double IPA Festival on the Brookston Beer Bulletin here. We honor Bay Area newcomer Strike Brewing with their nifty Brown Ale as the Beer of the Month for the February. You got to love a new Bay Area brewery that makes their debut with session beers. a) Double IPA's and other extreme beers, no matter how ridiculous or insipid, generate a lot more buzz than any well executed session beer. b) Any self-respecting rock star brewer wouldn't waste his time with something like a Brown Ale. c) It's easy to cover up brewing flaws by simply dumping shovels full of hops and spices into the brewing kettle. Thankfully, Strike Brewing bucks the typical trend, brewing an excellent, balanced brown with plenty of roasty toasty nutty flavors, and checks in just under 4% abv. It's one of those beers that made me sit up and take notice since so few breweries pull off simple pleasures like this skillfully brewed Brown. Strike Brewing was formed three years ago in San Jose by Jenny and Ben Lewis, with their friend Strike brewmaster Drew Ehrlich. All three played sports, with Drew Ehrlich playing professionally in the Boston Red Sox farm system, and were looking to brew beers for more active life-styles. (The Strike name comes from Ehrlich's baseball roots.) Hence, Strike's initially line-up consists of three flavorable session beers, a Blonde, Brown, and Porter, with a Wit on its way this February. For more on Strike Brewing, check out BetterBeerBlogger Peter Estaniel's nifty write-up on them last December. So let's raise our glasses to craft beer rookie Strike Brewing for doing something extreme: Brewing a well balanced and a flavorful session beer. As if going for a run in Golden Gate Park and then enjoying a great beer at a dollar discount from Social Kitchen and Brewery wasn't enough, they'll be plenty of prizes to win in the 3rd Annual SF Beer Week Beer Run post-run charity raffle to benefit Autism Speaks and the Contra Costa Food Bank in honor of beer writer Bill Brand. The run starts February 12th, 2012 at 11:00 am, beginning and ending at Social Kitchen and Brewery, 1326 9th Avenue, San Francisco, CA 94122. Click here for location. The generous response from both the brewing and running community has been overwhelming, and we're pleased to announce the following prizes they've made available to several lucky participants. Social Kitchen and Brewery, which is hosting this official SF Beer Week event will provide a $50 gift certificate to a lucky winner. On the Run Shoes, located just down the street from Social Kitchen, will provide a pair of Brooks running shoes. Adventure Sports Journal will provide "Earn Your Beer" t-shirts and other swag. Additional running gear prizes will be provided by Nike. Beer run co-founders Bryan Kolesar and Brian Yeager were able to scare up prizes from breweries from their respective cities of Philadelphia and Portland, with the following breweries have denoted prizes in the form of glassware, clothing, trinkets, and yes, beer. And Trumer Brauerei of Berkeley, CA will be throwing in some Frisbees. Raffle ticket are a dollar each, five dollars will get you 6 tickets, and $20 will get you 25 tickets. In the words of the late Bill Brand, "I'll see you there."